Pype integrates major comprehensive solutions to streamline process improvement for leading General Contractors across North America. Pype recently announced its enterprise-level partnership with Salt Lake City-based construction company, Layton Construction. Layton Construction, a top-ranked hospitality builder, has continued to make strides in the construction industry by partnering with Pype. The implementation of Pype's comprehensive solutions has led the company to achieve a higher rate of efficiency and effectiveness into their day-to-day operations. "We are very pleased with Pype software solutions," said Jeff Metcalf, Director of Information Systems for Layton Construction. "The software is so easy to use that our job teams haven't needed much direction, they've been able to learn the system and support themselves. We have several projects already rolling in the program." Through this partnership with Pype, Layton Construction will work towards their goal of finding new ways to solve today's critical construction challenges and be able to start projects faster, while reducing costs. Pype provides innovative construction software solutions that enable project teams to start projects faster and finish stronger. 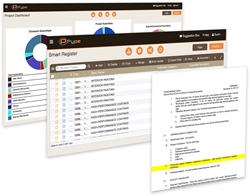 Start projects faster by generating submittal logs with Pype AutoSpecs. Our patent-pending software takes a manual, time consuming process and allows you to create submittal logs in minutes. With Pype Closeout, we have automated the entire closeout process which means you get paid faster.